'We like to think that the Claddagh ring was devised in Galway, but of course it wasn't," says Phyllis McNamara. The familiar motif of a heart held between two clasped hands has been used on rings since Roman times. It's a type known as a fede ring, which comes from the Italian mani fede (meaning hands in faith). In Ireland, they became known as Claddagh rings because of their association with the Galway fishing village. "We made it our own," says McNamara whose antique jewellery shop, Cobwebs, is on Galway's Quay Lane. The first Irish Claddagh rings date from around 1700 and they remained popular until around 1820. Now, rings from this period are very valuable indeed. They're also a bit strange looking. The heart tends to be elongated - more like a real heart than a Valentine's motif - and the detailing less precise. "An antique Claddagh ring wouldn't look much like a modern one," says Jimmy Weldon, a Dublin-based antiques dealer who specialises in silver and jewellery. "The gold would probably look yellower and the design would be lumpier." Georgian Claddagh rings are rare. It's not that likely that you'll find one in your grandmother's jewellery box. If you did, it could fetch between €2,000 and €10,000. In May this year, a Claddagh ring from Weldon's own collection sold at Adam's for €3,500. It was made in Galway around 1775. Georgian Claddagh rings were worn by men. "In Galway they were passed down from grandmother to granddaughter," McNamara explains. "The granddaughter would give it to her future spouse." She launches into a hilarious story of a Galway girl who gets engaged. Unfortunately, the fella comes down with a dose of "the maizles" and cops it. "Quick," says the girl's grandmother. "Go and get your ring back or you'll never find another husband!" The poor girl has to run down to the house where her former future husband is laid out and prize the ring from his cold dead finger. There are different stories about how the Claddagh ring came to Galway, each more farfetched than the next. One tells the story of Margaret Joyce, a member of the powerful Joyce clan, known as Margaret of the Bridges because she built most of the bridges in Connacht at her own expense. One day she was observing the work on one bridge when an eagle, flying overhead, dropped a gold ring into her lap. It was seen as a just reward for all her good works. It's a great story, but nobody really believes it, not least because the ring in the story has a gemstone. Some historic fede rings do have stones - there's a lovely one in the Victoria & Albert Museum - but the Irish ones were all plain gold. The second story is almost as unlikely. In the late 1600s, a Galway lad called Richard Joyce travelled to the West Indies. On the way, he was captured by pirates and sold as a slave in Algiers. His master was a goldsmith. Joyce trained as his apprentice. Then, in 1690, King William III of England ordered that all British subjects held in slavery in Algiers should be released. That included young Richard. The Algerian goldsmith, or so the story goes, offered him half his property and his daughter's hand in marriage if he would stay on. But Richard headed back to Galway, bringing with him the design for the Claddagh ring. This is a hard one to verify, but there was a real life jeweller called Richard Joyce working in Galway in the early 1700s. And he did make Claddagh rings. Then again, as McNamara points out, the Claddagh ring might just have easily been the Kinsale ring. One of the earliest examples is attributed to Thomas Meade, a goldsmith who was admitted to the Freeman of Kinsale Corporation in 1689. Galway goldsmiths continued to make Claddagh rings throughout the 18th and well into the 19th century, when the process became more industrial. Although tradition has it that the ring was widely used among the people of the Claddagh, there's been much debate over whether poor fishing folk could afford them. Ida Dellamer, writing in the Irish Arts Review Yearbook (1996) blames Mr and Mrs Hall, a British couple who published a three-volume description of Ireland in the 1840s. The Halls describe the tradition of using fede rings in the Claddagh: "These rings are largely of solid gold and not infrequently cost from two to three pounds each." But, as Dellamer points out, where would they get that kind of money? Dellamer goes on to argue that: "While the women of the Claddagh certainly wore wedding rings of the Claddagh type, these were often made of various alloys of gold, silver, brass, bronze, and guinea coins." McNamara agrees. "There was always some gold in the rings, but they were very low carat." She has a 19th century Claddagh ring in her collection but she's no intention of selling it. It's too precious and too important a part of Galway heritage. Instead, she's had it cast so that a local goldsmith can reproduce it in rose gold. It's entirely made by hand in Galway and costs €395. It's not the real thing, but it's probably as close to it as most of us can afford. A linen-covered American travel box (est €300 to €500) that possibly belonged to John F Kennedy is among the lots on offer at Matthews' auction rooms tomorrow and Sunday. The box, which may have been left in Dublin by JFK, is certainly marked with the correct initials. "I know it's only a travel box, but it's a nice thing and certainly of some interest to those who collect John F Kennedy memorabilia," says Damien Matthews, auctioneer. The auction will be held in Dukes Brothers, 7 Market Street, Kells, beginning at 1pm each day. See matthewsauctionrooms.com. Fonsie Mealy Auctioneers will hold a rare book sale at the Tara Towers Hotel, Dublin, on December 5. Collectors of children's books will note a very rare copy of The Story of the Discontented Little Elephant, told in Pictures and Rhyme (1912) by Edith Somerville (est €500 to €700). There is also a collection of children's books (est €180 to €220) by Walter Crane and Randolph Caldecott including This Little Pig His Picture-Book 1895 by Walter Crane. 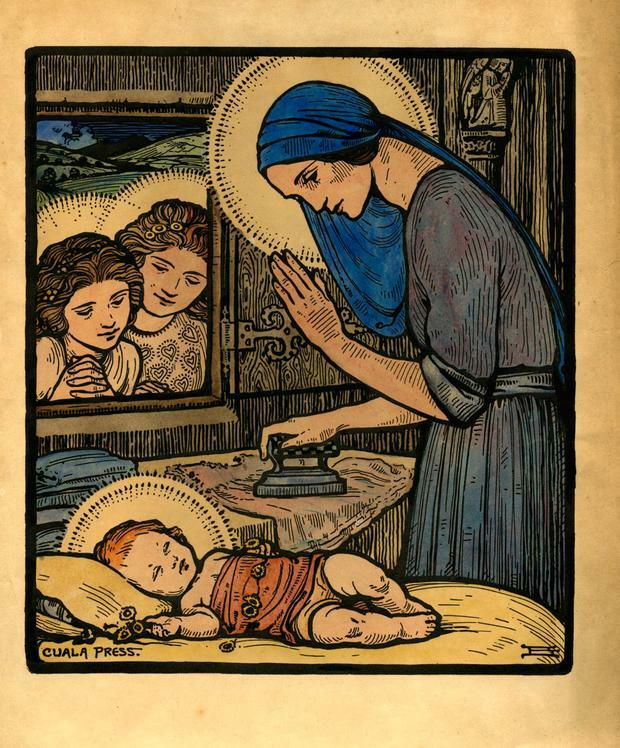 Other Christmassy items include an early hand-coloured Cuala Press Print, The Child Jesus & Virgin Mary (pictured, est €200 to €300) which features the Virgin Mary doing the ironing! See fonsiemealy.ie. Lots of interest at the next auction in Victor Mitchell's Mount Butler salerooms, Roscrea, Co Tipperary on December 6, include a seven-foot long Regency mahogany sideboard (est €800 to €1,000); a Regency walnut credenza (est €800 to €1,000); an Adams white marble fireplace (est €1,200 to €1,500); a bronze bird bath by sculptor John Behan (est €1,200 to €1,500); and Persian floor rugs. Previews tomorrow/Sunday from 1pm to 6pm and Monday/Tuesday, 9am to 6.30pm. See victormitchell.com. Silver spoons anyone? If you weren't born with one in your mouth, there are plenty on offer at the Kinsale Christmas Antiques Fair tomorrow and Sunday in Acton's Hotel. The fair includes some very special silver spoons, brought down by JW Weldon of Clarendon Street: a pair of bright cut antique Cork tablespoons, circa 1790, by William Reynolds (€1,250); a set of 18 Irish silver soup spoons/dinner spoons, Dublin 1751 by John Pittar, engraved with the crest of Clotworthy Skeffington, First Earl Massereene, (1715-1757) (€4,750); and an Irish soup ladle, Dublin hallmarked 1772 (€1,450). You need to have been born with one in your mouth to afford one, but there are items at pocket-money prices. Fran Power When the vendors of Claremoy Cottage, a few kilometres outside Lahinch in Co Clare, want to go for a swim, they look out the bedroom window to check the tide.